It’s that time of the year when Santa comes down the chimneys or pipes, if you have no chimneys. So, it is the time to be happy. Season of thanking and giving should not be forlorn for your soul if you believe in Santa. It is an adjective. Forlorn can be learnt by associating the sound of first half (for) and second half of the word (lorn) to two different words. For (Fur) lorn (lawn) .i.e. lawn of fur and if you want to associate with the meaning of forlorn then lawn of fur will be a sad state of affairs anyway. forlorn can be learned as “for ever alone”. 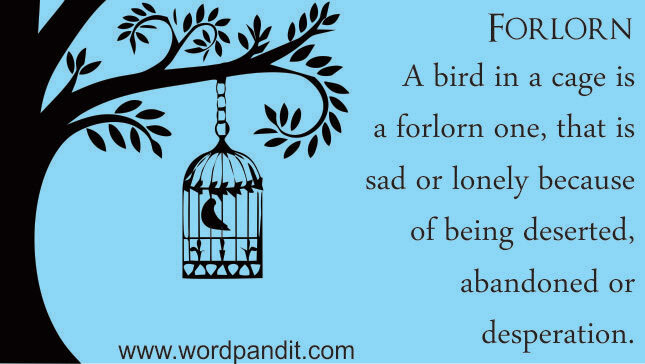 And the person who has been lonely is sad, dejected or in a “forlorn” state. i.e. something to be sad about.